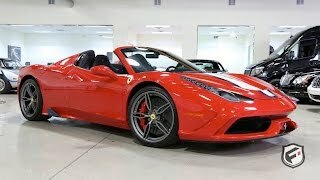 Soon after the release of 458 Italia in 2010, Prancing horse released it’s all new with better specification Ferrari 458 Speciale in 2014. Gaining a huge success the model eventually made the company to release a roofless model of same, Ferrari 458 Speciale A 2015. Let us see after losing its roof did it again anything more in its exterior, interior and yes the power beneath its hood. Interior of Ferrari 458 Speciale A 2015 carries the same carbon-fiber glory like its roof-top version. Same squared steering wheel mounted with vital controls to provide ease and give you proper control upon ride. However a minute change noticed in the interior of 450 Speciale A roofless version comes through the ‘illuminating’ yellow stripes, matching the exterior body paint of model. We at our end believe it’s a great adjoining while the rest remains the same in context to space provided inside, controls, embossing logos etc. Exterior of Ferrari 458 Speciale A 2015 carries the same aggression with its wide exhaust and massive diffuser. Officials at Ferrari also mentioned that 458 Speciale A 2015 is their most aerodynamic convertible ever created. However we feel that once you put that metal top on, in 14 seconds, the overall look remains same. 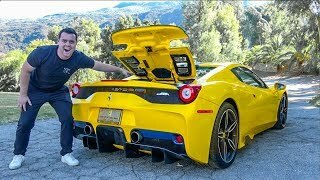 But in all there is one thing that particularly interested us and that’s the yellow colored exterior, though not a yellow lover but still the color looks attractive and adds commendably to the entire ferocious exterior of Ferrari 458 Speciale A.
Ferrari 458 Speciale A 2015 gets its power through a 4.4 Liter naturally aspirated V8 engine. This mounted engine is capable of producing 596 HP and 540 nm torque. 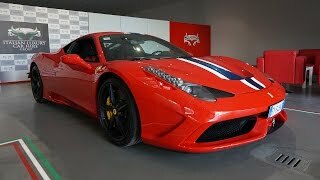 Thus the Ferrari 458 Speciale A is capable of finishing the 0-62 mph sprint in just 3 seconds while 124 mph from standstill can be touched in noticeable 9.5 seconds. Not only these, this aggressively looking roofless model, with its powerful engine holds the record of lapping the Fiarono in 1 hour 23 minutes 5 seconds. Hearing it from Ferrari they say, the commendable statistics are the result of its front and rear active aerodynamics and side slip angle control which ensures an unparalleled sporty driving irrespective of condition.